For those of you living in the UK, Maggie Goes on a Diet will be featured on 5live, at 5pm on channel 5 tonight. 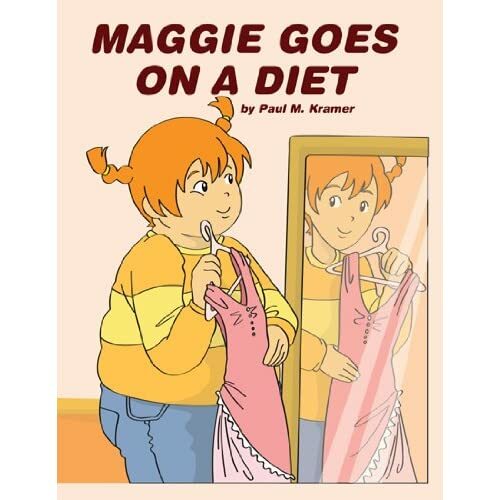 Posted in News and tagged Channel 5, feminism, Maggie Goes on a Diet. Bookmark the permalink. Think armchair activism gets you nowhere? You’re wrong! TreasuryIslands had a bit of a rant yesterday about a book to be published in October, Maggie Goes on a Diet. We encouraged you to nail your feminist colours to the mast and hop over to Amazon to tag the book as appropriate. The cry went up: our daughters do not need this, and the tags began to appear. I started with ‘give your children neuroses’ and you, dear Islanders, followed suit; ‘anorexia’, you added, ‘quack’; ‘body fascism’; ‘feminism what feminism’; ‘irresponsible publishing’. The list continues to grow. Thank you. And then, through the power of Twitter, and with enormous thanks to reader AliB, the Guardian Women’s Blog picked up the story. The author is yet to comment, but be assured TreasuryIslands is keeping a very close eye on this one. Update, 18/08/11 Maggie Goes on a Diet is now featured on Jezebel.com and Dadventure, De Telegraaf (Dutch), Top News, ABC Nyheter (Norwegian), CT Now, TVNZ and Netmums. Posted in News and tagged In the news, Maggie Goes on a Diet, the Guardian. Bookmark the permalink.